calling all Naughty Nurses, Demented Doctors & Perverted Patients…. first time together in NYC since 2005! On Tour supporting their new album "The War Inside Me"
Defining aggressive electronic rock, melding elements of metal, electro and drum 'n' bass to create a unique sonic assault. Breaking down the barriers between guitar and electronic genres. "The Medication Generation", a futuristic audio assault exploring the excess of self-medication and mass media saturation in present day society. 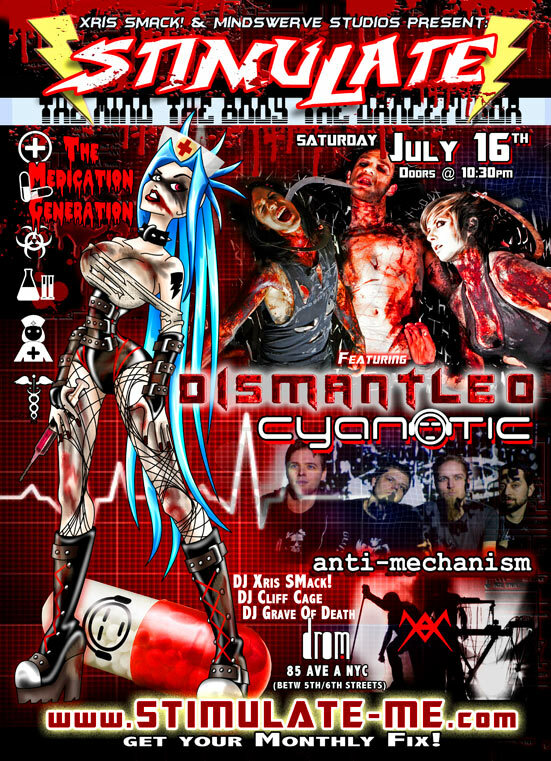 Challenging the foundation of electronic industrial music, Anti-Mechanism's performances showcase an aggressive stage show with dramatic lighting & visuals to match, resulting in intense, audience inclusive shows. they will be featuring material from their forthcoming album "Moments Before the Collapse"
and Guest Dominatrixes The Mistress Lauren, Kassandra & more! * STIMULATE 8/20: "Superheroes vs SuperVillains"
* Giveaways from METROPOLIS RECORDS and more! Straightjackets, Lab Coats, Scrubs, Zombie Nurse, Blood blood BLOOD! come as your favorite character and be a part of our costume contest! and Sept 17th for our 3 YEAR ANNIVERSARY !! !